under HKEY_CURRENT_USER\Software\Microsoft\Windows\CurrentVersion\Explorer\UserAssist, create a key named Settings and under this new key create a DWORD value named NoLog with value 1. My UserAssist tool has a menu toggle (Logging disabled) to do this easily. I call this a secret, because there is no official Microsoft documentation about this key, but of course, there are many pages on the Web about this switch. 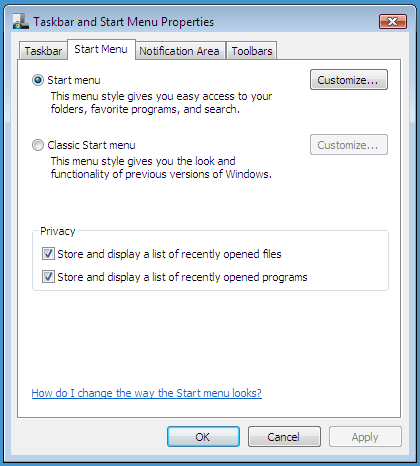 The Store and display a list of recently opened programs checkbox allows you to toggle this Start_TrackProgs registry value. Like for Windows XP, changing this switch only has effect after restarting Windows Explorer.